Measures reflected light with myriad colors, not just a handful. Reveals nutrient needs in plants. We think of AirScout as a tool for farmers and agronomists – not unlike a tractor or combine. It can be that essential. 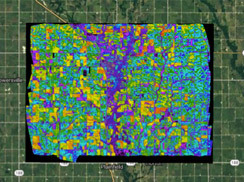 With four types of advanced high-resolution imagery, integrated drone platform, an app you can bring in the field, and a robust Prescription Tool, AirScout represents a big step forward in delivering the promise of precision agriculture. 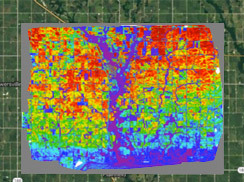 You’ll be able to see signs of plant stress weeks sooner than with existing NDVI technology with AirScout Thermal Imagery.™ AirScout ADVI™ Imagery gives you orders of magnitude more resolution. 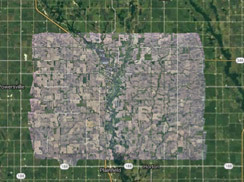 And digital visual images are crisp, clear, and automatically snap into the Google Earth grid. AirScout helps you find crop trouble before trouble finds you. Data collection 10 times or more through the growing season. Your choice. The sooner you spot a problem and treat it, the lower the cost to fix it and greater the yield potential. You instantly see anomalies or patterns that need a closer look, called ground truthing. AirScout steers you there on your phone or pad. You know precisely where to go to diagnose the specific crop stress problem in the shortest possible time for the earliest intervention. AirScout’s Prescription Tool fits with the way you do things. We don’t spoon-feed you a generic solution. You make the calls.